"Deep calls to deep - unless we are willing to launch deep, it will be impossible to reach the depths, the fullness and riches of God. Such deep worship is hardly heard in our days. Thank you for allowing your heart to go deep to receive songs from Father's heart"
Give us a call to place your order by phone or for personal assistance. Pay by check or credit card. "When ever it seems that the battle is raging, I play your music and the anointing breaks that heaviness. " "I get drenched in His Love when I hear your songs... "
Click Add to Cart on the item you wish to purchase. It will be added to your shopping cart. Your order will be processed securely through 2CO. Please provide correct billing address and email to ensure proper processing. You may change or cancel your order at any time. If you are downloading you must click on the final link to be taken to the downloads. CLICK HERE TO CHECK OUT THE INSTRUMENTAL ONLY VERSION OF THIS ALBUM. Purchase the CD and have it shipped to your address. Do you find it difficult to pray? Does your mind have a tendency to wander when you do? Would you like to sense more of His presence when you pray? Deep Calls to Deep aptly meets this need. It helps to create spiritual hunger. Capturing the heart’s longing for a more intimate encounter with the Spirit of the living God, this one hour session of anointed, restful, healing music is a wonderful aid to nurture our desire for more of Him. Alternating between brief moments of prayerful expressions of the heart and longer instrumental interludes, this album is an excellent aid for contemplative prayer. The music is not overly intrusive and can be considered as background music for whatever purpose the listener has in mind. The first track Deep calls to deep is an 18 minute soliloquy capturing the heart’s longing for a more intimate encounter with the Spirit of the living God. Alternating between brief moments of prayerful expressions of the heart and longer instrumental interludes, this sets the tone of the album as an excellent aid for contemplative prayer. A brief piano instrumental track Selah. The Amplified Bible translates the Hebrew word selah as "pause, and think of that.” It is used 71 times in the Psalms where it is also probably used to indicate that there is to be a musical interlude at that point in the Psalm. This simple piano instrumental “selah” gives the listener some time to contemplate the longing of the heart in the previous track "Deep calls to deep", and fully make these longings their own. Alternatively, it may simply provide some light background music for the listener to offer their own prayer. I call you friend is a 9 minute combined vocal / instrumental response from the heart of God, who sings over us our acceptance in Christ. There is no sin or condemnation to those who are accepted in the Beloved. He has made us righteous in His sight, and He calls us His friend. Another “Selah” moment follows allowing the listener some time for contemplation. These simple piano instrumentals act much in the same way as a sorbet does between courses during a meal at a restaurant. They cleanse the palate from the previous course so to speak, enabling a purer appreciation of the unique flavour in the next course of song which is to follow. Rest is an 8 minute instrumental featuring the acoustic guitar. It is lovely background music for soaking. The third and final “Selah” moves seamlessly into the closing moments of the album featuring some natural sound effects of the ocean, enabling the listener to drift off into a deep and restful sleep, if so desired! 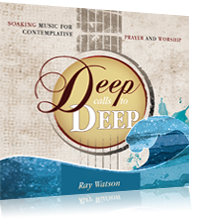 Deep Calls to Deep was written as an aid for contemplative prayer and worship. It is primarily an instrumental soaking album, with elements of prophetic song woven throughout the contemplative journey. These memorable moments in song capture concepts of God’s goodness and love, and provide the listener with a focus for prayer. The entire album was initially conceived and recorded spontaneously over a period of several days. Rich orchestration has been added to the original recording. The Secret Place trademark touch of spontaneous song makes Deep Calls to Deep a treasure for those who hear His call. Although most of my recent album releases can be broadly categorised as “soaking music” there seemed to be a need for something a little more instrumental in nature and targeted more specifically for contemplative prayer or personal times of soaking. Although the singtrax version of Seek My Face (instrumental only) is perfectly suited for this purpose, I still had it on my heart to create an album that was specifically targeted for a soaking audience, and was tailor-made for contemplative prayer and meditation. "Deep Calls to Deep captures the heart’s longing for an intimate encounter with God." I felt there was a need for a mainly instrumental album but one that also had some element of song woven throughout the instrumental texture to help provide some moments for meditation or contemplative prayer. It is a wonderful aid to help create spiritual hunger. As a spiritual tonic, I often find myself at any moment recalling a certain melodic phrase, such as, “I call you friend” which has a wonderful therapeutic effect on a soul prone to depression. The success of this album is due in no small measure to the considerable contribution made by Rob Packer and Peter Robertson. Special thanks to my friend Rob for his excellent keyboard work. His ability to flow spontaneously in the creative process and his sensitivity to our partner the Holy Spirit, has made this project possible. The ministry of The Secret Place would not be what it is today without Pete’s friendship and support over many years. I am deeply grateful for all his guitar work on The Secret Place albums. Message: 6czpSI My brother suggested I might like this web site. He was entirely right. This post truly made my day. You can not imagine just how much time I had spent for this info! Thanks! Message: Z3etYX Very good information. Lucky me I recently found your website by accident (stumbleupon). I ave bookmarked it for later! Message: nSqpFp Muchos Gracias for your blog article.Thanks Again. Really Great. Message: t1fxMr Incredible points. Great arguments. Keep up the good spirit. Message: buu0pF I used to be able to find good advice from your blog articles. Message: OO4IdK Thanks for the article.Really thank you! Great. Message: Wvb2cp Your style is so unique in comparison to other people I have read stuff from. I appreciate you for posting when you ave got the opportunity, Guess I all just book mark this web site. Message: YKerZF Im obliged for the blog article.Much thanks again. Really Cool.